India could consider offering a one-time settlement to clear legacy central excise duty and value added tax (VAT) issues to ensure they do not linger and act as a drag in the goods and services tax regime. The GST Council, the apex decision-making body for the tax, will take up the proposal at a meeting on August 4. 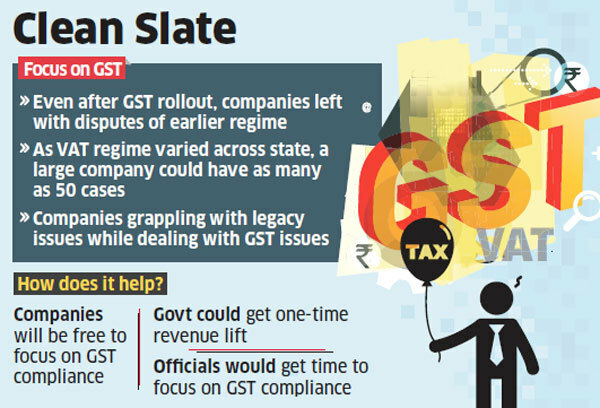 The scheme, if approved, would allow officials to focus on GST compliance instead of dealing with legacy issues and could also generate instant one-time revenue for the government. “It would clean the slate,” said an official privy to the proposal. The scheme could cover assessments as well as arrears, according to the proposal that is part of the council’s agenda. GST was rolled out on July 1 last year, replacing a range of central and state taxes including central excise duty, countervailing duty, cesses, VAT , entry tax and purchase tax. There is a backlog of two or three VAT assessments for every dealer in each state, according to an industry experts. As a result, tax teams of companies are not only grappling with GST law and compliance requirements, but are also compiling documents, collecting pending statutory forms and preparing reconciliations to complete VAT assessments. Most tax manpower has shifted to GST and only a few are left to cater to the old tax regime, which is further fuelling pendency. “For companies with pan-India operations (e.g. in FMCG, consumer electronics), at least two-three assessments are pending in each state. Thus, assuming a company has operations in 20 states, the total number of pending VAT assessments for such company in all states could be in the range of 40 to 50,” said Harpreet Singh, partner, indirect tax, KPMG. The government is keen to cut down on unnecessary disputes and litigation. It recently raised the monetary thresholds for filing appeals by the Central Board of Indirect Taxes and Customs as well as the Central Board of Direct Taxes. CBIC will withdraw 18% of such cases from tribunals, 22% from high courts and 21% from the Supreme Court. The CBIC has asked its field formations to clear past cases expeditiously to focus on the GST regime, which is still settling down.